Chest injuries after a car accident are common and can be severe or more serious. While seat belt use certainly saves lives, they can also cause chest injuries to people who are involved in car accidents. In an accident, the seat belt tightens in order to forcefully hold the person in place. This can cause several different types of injuries, including abrasions, bruising, fractures to the rib and sternum, injuries to the organs and intestinal injuries. 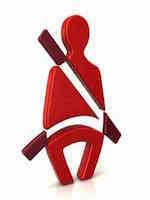 It is important to seek medical help when a chest injury from a seat belt is suspected. While these injury types may appear to heal fairly quickly, they can indicate much more severe issues including the outlined injuries as well as internal bleeding or torn cartilage, muscles, tendons or ligaments. With more minor chest injuries, people may experience pain in their chest wall when they try to move their shoulder, arm, trunk or rib cage. For days afterwards, the person may feel chest pain when they breathe deeply, lie on the area, sneeze or cough. While a minor chest injury may not need medical treatment, it is still a good idea for people to see their doctor to make certain the injury they suffered is not something more serious than the person might think. If the person who suffered a chest injury in their accident is having trouble with breathing and is experiencing severe pain, they may have suffered serious injuries, including damage to the lungs, blood vessels or heart. They may also demonstrate symptoms of shock or extreme shortness of breath. This can happen when a person has experienced a blunt force trauma to their sternum or a sternum fracture in their accident. Blows to the front of the chest can also cause injuries to the lungs or trachea. If the impact is lower or to the side of the chest, the person may also have injuries to their liver or spleen. Fractured ribs and fractured sternums are quite common with seat belt injuries in car accidents. Rib fractures may be very painful and take weeks to heal. The connective tissue and cartilage between the ribs may also be torn. The symptoms of a rib fracture include severe and sharp pain in the injured area, pain that worsens when the person coughs or breathes deeply and sharper pain when lying on the area. Sternal fractures may cause tenderness and severe pain over the injury site. People may have trouble breathing deeply and may experience increased pain when they try to do so. Sternal fractures may also cause injuries to organs underneath the sternum. In some cases, a fractured sternum is also associated with fractures to the ribs or injuries to the spinal cord as well. When a person is involved in a car accident and suffers a chest injury from their seat belt, it is very important for them to seek immediate medical attention. A doctor can give the person a thorough medical examination in order to determine exactly what injuries were caused and then to provide appropriate treatment. Failing to get immediate care may make injuries worse. In some cases, some injury types may be fatal if not treated. If the person’s accident was caused by another driver’s negligent operation of their vehicle, the injured victim may then want to get help from a car accident attorney after they have gotten help from medical professionals. An attorney may advise them of their rights and work to secure compensation in an amount that is fair and that covers their losses.